A better turnout of 1,642 head of sheep at last Wednesday night’s sale in Armoy met with a nice trade. Fat Lambs sold to £95.00, Fat Ewes to £94.00, Store Lambs to £76.00. FAT LAMBS: Liam McDonnell, Ballycastle, 30kgs £95.00.S Moore, Coleraine, 26kgs £94.00. Gemma Bartlett, Ballymoney, 26kgs £90.00. Alex Hughes, 26kgs £92.00. Altmore Farms, 23kgs £83.50. Andy Hillen, Ballymena, 23kgs £83.50. B O’Kane, Martinstown, 22kgs £80.00. M McClafferty, Armoy, 24kgs £86.00.Stephen McCahon, 22kgs £80.00. Gemma Bartlett, Stranocum, 23kgs £88.20. Niall McKeague, Ballycastle, 24kgs £90.00. Alex Hughes, 23kgs £83.50. 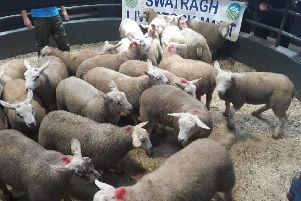 STORE LAMBS: S McShane, Ballintoy, 24kgs Suff, £76.00. G McCambridge, Ballycastle, 50 Suff, £67.50, 50, Suff, £67.00. S McDonnell, Ballvoy, 40 Suff, £68.80. S McCambridge, Ballyvoy, 85 Suff, £66.00, 64 Tex, £65.20. John Cassley, Armoy, 39 Tex, £64.00. Chris McNaughton, Loughguile, 26 Tex, £65.50. Paddy McDonnell, Cushendall, 39, Suff, £62.50. Cahal McVeigh, Ballyvoy, 20 Tex, £63.50. S McShane, Ballintoy, 17 Suff, £60.00. S & E Garvin, Garvagh, 11 Tex, £71.00, 10, £64.50, 14, £63.50. S McDonnell, Ballyvoy, 25 Tex, £64.50. John Hurl, Carnlough, 6 Tex, £61.00, 8, £63.50. G Emerson, Cushendall, 22 Suff, £58.50. Alistair McGuckian, Cloughmills, 53 Tex, £58.50. FAT EWES: S McAuley, Ballycastle, 10 Tex, £94.00. M McClafferty, Armoy, 11 Suff, £89.00. S Hill, Ballycastle, 3 Tex, £85.50. A Laverty, Armoy, 1 Tex, £85.00. John Todd, Ballycastle, 33 c/b’s £65.00. E McKeegan, Cushendall, 4 Mules, £75.50. A Murphy, Cushendun, 12 b/f £52.00. S McCambridge, Ballyvoy, 30 Tex, £76.50. Wm Moore, Macosquin, 2 Tex, £75.50.